While we were back visiting Larry's family in Pennsylvania during the holidays, Ava had the opportunity to spend some time with a few of her great grandparents. 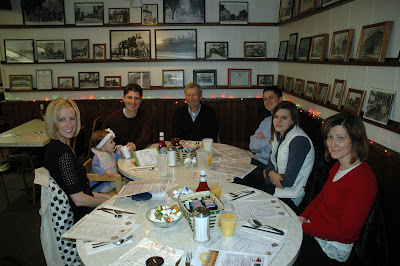 Great Grandpa Furr took us all out for breakfast at Diener's in downtown Mechanicsburg. 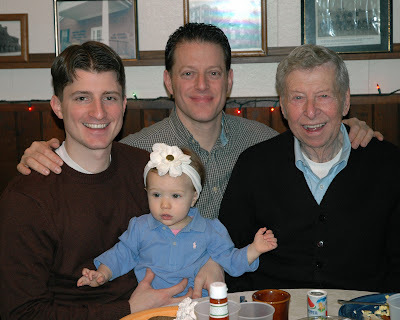 Here is a four-generations picture with Larry's dad and grandfather. 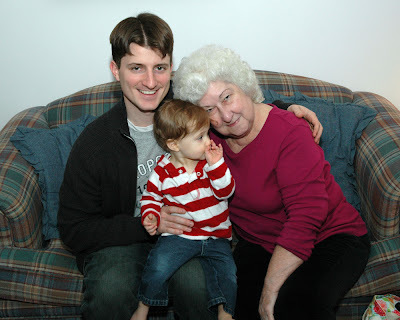 A few days later we took Ava to visit her Great Grandma Pickett. 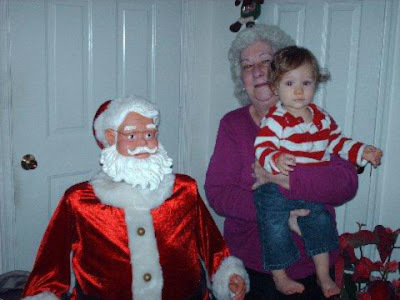 Although it has been months since she's last seen her great grandmother, Ava warmed right up to her. Ava especially liked Great Grandma Pickett's singing and dancing friend who lives in the closet. No, not one of the Village People, but rather Santa Claus. After having so many fun people to visit with, we're afraid that Ava must think that her parents are quite boring in comparison. Hope Ava realizes how lucky she is to have such great Grandparents!!! Wish we had that for Klous too...oh well...hopefully he knew them 'before' he came huh!! She's awfully cute with them all though! !